roof must not go down into the house to pack. the world. And it will never be so great again. out! I have warned you about this ahead of time! farthest ends of the earth and heaven. disappear, but my words will never disappear. that time will come, be on guard! Stay alert*! 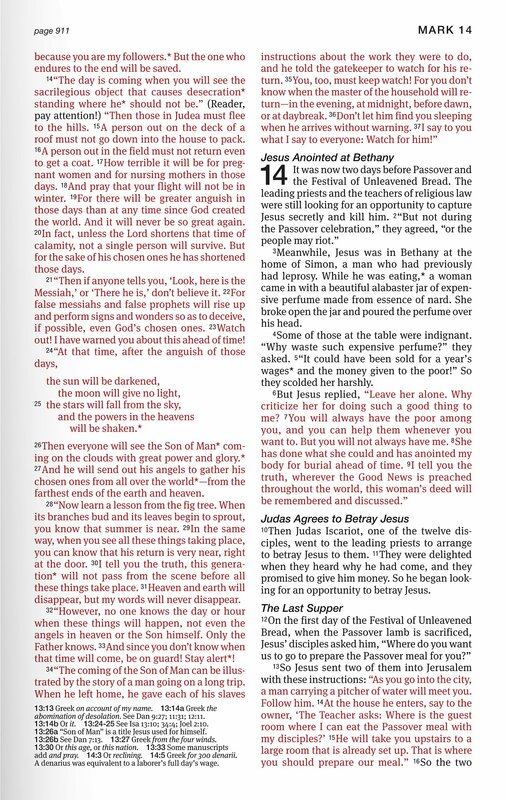 34 “The coming of the Son of Man can be illustrated by the story of a man going on a long trip. abomination of desolation. See Dan 9:27; 11:31; 12:11. 13:14b Or it. 13:24-25 See Isa 13:10; 34:4; Joel 2:10. 13:26b See Dan 7:13. 13:27 Greek from the four winds. add and pray. 14:3 Or reclining. 14:5 Greek for 300 denarii. A denarius was equivalent to a laborer’s full day’s wage. 4 Some of those at the table were indignant. promised to give him money. So he began looking for an opportunity to betray Jesus. a man carrying a pitcher of water will meet you.